The mHealth group we started back in 2008 on Linkedin has now grown to more than 4000 members. If you’re not already a member click here to check out a who’s who of the group or click here to jump straight into the discussions, promotions and job postings and start getting yourself networked with the key professionals who are working on the world’s most exciting mHealth developments. If you’re already a member please think about inviting a friend or colleague you know who is interested in the mHealth opportunity. This is very easy to do: simply log in to the group and click “Share group” on the right side of the group’s menu bar. Then click “Invite Others”, then click on the blue ‘in’ logo on the right side of the “Connections” box to invite people from your Professional network. You can also personalise the “Welcome message” before you click to “Send Invitations”. Whilst most of the new Android Smartphones do work with the Alivecor ECG (click here to see it being used with a Samsung Galaxy at the mHealth Summit last year) the product that is currently for sale today on the Amazon store is designed to also be used as a case for the iPhone 4 or 4S. This has several advantages eg. the casing protects the iPhone from wear and tear, the sensor and mobile will always remain together ensuring you never forget to take your ECG monitor with you, etc. The annual American Telemedicine Association Meeting is coming up in Austin Texas from May 5-7 – are we meeting there? I won’t be making it to the ATA in May but if you would like to host the mHealth group meetup (perhaps on your trade booth etc) please feel encouraged to do this and I will promote it on this blog and over in the group etc. This proved very popular at the mHealth Summit in Washington last year and it would be great if it could be hosted at the ATA. Let’s agree all the details via email (I’ve sent you a Linkedin invite so you’ll have my email address). 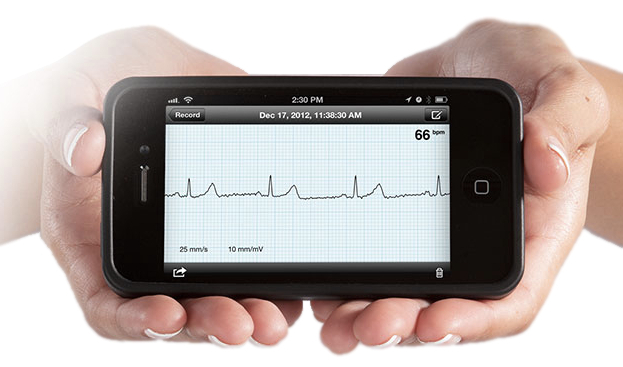 The AliveCor ECG is available in the UK through Amazon. How about the US? Please Note: To qualify for our free read service you need to buy the device via the UK/Ireland Amazon store with the discount code “3GDOCTOR” and the Patient using the device must be located in the UK or Ireland. Sorry, I should have been more specific. There are restrictions in the US on who can buy it (licensed professional or as a prescription) but Amazon in the UK does not list such limitations unless I missed that part. I found that interesting as it makes it as available as a blood pressure cuff or scale for self-monitoring. I’m a bit confused do you think there should be restrictions on Patients being able to buy devices like this with their own money if they feel they can benefit from having them? FYI here in the UK/Ireland you can also buy a blood pressure monitor that will also screen for AF. Actually, I like the idea of someone being able to buy it without a prescription. A few months ago, I told someone who wanted to better monitor their own heart between the 6 month visits to the cardiologist about the AliveCor device. They wanted to buy it, but were unable to directly. This person will have to ask their cardiologist for a prescription to get one, hope their cardiologist will know about the device, and then agree to prescribe it. I wish the process to purchase one was as simple here as in UK.